If you thought the wireless earbud space began and ended with Apple's AirPods, think again. With better smarts and often more appealing designs, alternatives from startups are truly on the rise, Waverly Labs' Pilot earbuds being a prime example. Since the AirPods launched over a year ago, we've seen hearables continue to mature, honing in on sound augmentation and fitness tracking. But it's perhaps the push into real-time language translation that has garnered the most buzz within the space. And after launching its Indiegogo campaign almost two years ago and raising a whopping $4,426,011, New York startup Waverly Labs is finally preparing to roll out its $249 Pilot — a pair of translation earbuds that aim to break down the barrier of language and help strangers from around the world more freely communicate. We've been living with the Pilot for the past few weeks and testing out its translation capabilities, sound quality and design to discover whether this is truly a hearable that opens doors. The pull of the Pilot is naturally the translation element, but the fact remains that there are more aspects to consider when looking at a hearable. And since this is something that will be invading your ear-space and sitting on show at all times, the design is crucial. There are two earbuds — coming in a set of black, white or red — which fit into either ear. A button sits on top of both for on/off, pairing and play/pause functions, depending on how long it's held down. We've seen some pretty polarising designs fill the space over the past couple of years — not just from Apple and Google, but also through the likes of Sony's Xperia Ear Duo and more sporty devices which employ a neckband or around-ear element. By contrast, Pilot offers something more in line with the what should become the standard within the industry — small and unobtrusive earbuds. 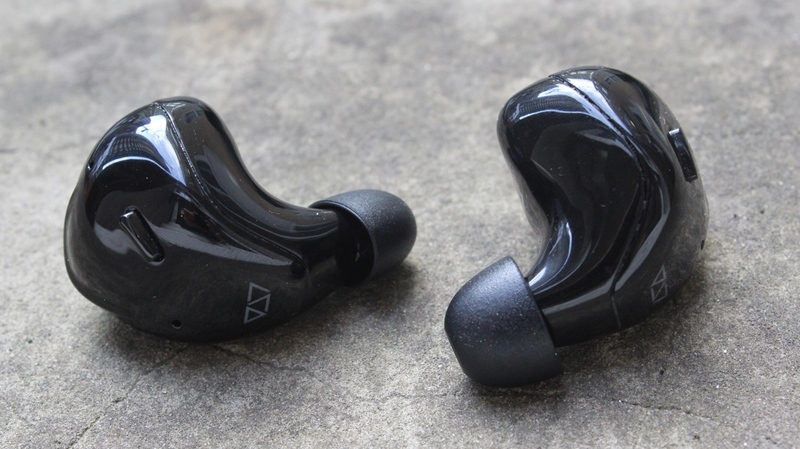 Take off the rubber bud and one of the earpieces is roughly the same size as a quarter, and that means they don't stick out too much when inserted, much like the Bragi Dash Pro. And while they're sleek to look at, the fit is good too. When we first tried the Pilot, we were concerned that there was too much open room in the ear. But after switching over the to the bigger rubber buds (you'll get three different sizes within the box to choose from), things have been considerably more snug, which has also led to a vast sound improvement — more on that later. It speaks to the importance of finding the right bud, but, regardless, the Pilot's design is impressive. We've worn plenty of hearables that can cause the ear to ache after continued use, but this manages to remain comfortable and fitted whatever the occasion. These aren't necessarily earbuds designed for exercise, but we've experienced no issues using them in the gym while lifting weights, running, cycling, rowing, planking — you name it. You'll need to slightly twist to tighten things up from time to time, but movement isn't significant enough to cause the buds to come unhinged. Translation isn't the easiest thing in the world to test, but we gave it a good go during our time with the Pilot earbuds. As company CEO Andrew Ochoa told us during a demo with the Pilot, though, the feature works best when each user is speaking their native language. You'll also need to ensure you're not in too much of a chatty environment. Coffee shops and loud bars are a bit of a no-no with Pilot, since the buds are listening for a specific frequency that can often be interrupted by people talking at the same level. As for the languages, Pilot can translate 15 of them, with regional variations also accounted for. So, take Spanish as an example — you'll have the algorithm slightly tweaked depending on whether the speaker is from a South American-speaking Spanish country (such as Colombia, Argentina and Uruguay) or, say, the US, with the option to select a dialect coming before you begin a conversation. Charged up: Is there a missing element with translation hearables? The main mode for the translating business, Converse, comes through the Pilot app, which a user will need to download in order before they engage in a conversation. Through this, you can either select to have a one-on-one or group chat, as well as whether the person you're speaking with will be given one of your earbuds to speak into or simply use their phone as a mic instead. On paper, it's all great. And in practice, we've found it's been mostly solid. This is definitely still technology that's rough around the edges — for example, grammar during the read-out on the hosting smartphone can often be lost and tenses aren't always accurate — but you do intuitively pick up context during the flow of a conversation. And that feedback from the smartphone is essential to the experience, as you know you have backup if you don't quite catch the relayed translation from the earpiece in real time. Latency also isn't too much of a problem. By the time the earbud has worked out that one user has stopped speaking, processed the sentence and then started feeding it back, you've waited around two or three seconds. In terms of our own testing, we've trialled the buds in prolonged chats with British native speaking Spanish and a Brazilian talking in Portuguese — the latter being a complete stranger. And by comparing the two sets of conversations, we have noticed the difference between native speakers which Ochoa alluded to. It's not the biggest issue, and the Pilot can still find its way for the most part, but it didn't feel as seamless as talking with a native speaker. Words were misinterpreted more often, sometimes to the point where it was hard to gauge the true meaning of a sentence. Going back to the point of using the Pilot in different environments - we've found that things are indeed better in quiet places, too, as Waverly itself states. As expected, when trialling in the comfort of a kitchen, with no background noise, things were more accurate than in a bar surrounded by chatter. And as a result, we didn't even entertain breaking them out in a noisy market or busier bar, for example. And this is one of the biggest current drawbacks of the technology, because it does limit when you can break out the buds; you don't really want to have to think too much about when and when you can't use them. You want them to work well every time. Technical limitations aside, when testing something like this — a burgeoning area of technology — it's also important to factor in the overarching concept itself, and not just how accurately the device is able to do its job. The process of using language translation earbuds is still something that still feels a little uncomfortable. There's no doubt it can be helpeful, but whether you feel comfortable enough to do so on a regular basis and whether you can really have conversations in the same way as you would if you spoke the language fluently is heavily dependent on the two users' familiarity with the system. At this point, while the technology is still in its first generation, we imagine many users of Pilot will be more comfortable with the Listen feature, which lets you hold your phone out, capture voice from the speaker and hear it back in your language. This is still in beta, but when we did trial it briefly with our Portugue-speaking Brazilian volunteer, it seemed to work just as fluently as Converse. Even the most seasoned travelers won't need to translated things all the time and, thankfully, Waverly Labs has managed to make the Pilot worth keeping in your ear even when you just want to just listen to music. As we mentioned earlier, it's imperative that you pair the Pilot with the right buds to maximise the quality, but generally we've found the sound to be excellent. In the gym, it easily blocks out the bass of mind-melting speakers, and on the tube you'll rarely have your listening interrupted by, say, the screeching railway. That said, there are a couple of issues with the connection that we've come across. Since the Pilots connect over Bluetooth, with the user directly connecting to one and the other pinging off that connection, you're almost definitely set to experience some inconsistencies. On pretty much every occasion we've worn the buds, there's been a warm-up process of roughly a minute whereby sound will flicker between each headphone. If you turn your head to check traffic, or go to pick up something off the floor, this same drop-off in audio is also fairly common. Generally, we've found indoor environments to be a bit more friendly than outdoors, where there's much more Bluetooth noise, but this is true of most Bluetooth headphones. And while it is jarring, once things are up and away you're generally in for a good experience. It's just that there are better Bluetooth headphones out there. Pairing can also be a bit fiddly. Initially, we found that only one of the earbuds was able to connect to a phone, while the other flashed red and white on the to signify it was struggling to get a connection. However, after resetting the buds (via the slightly complicated method detailed within the app), we did find this issue smoothed itself out. In terms of battery life, things are fairly steady here. Juice will drain more quickly if you're using hammering the translation features, but Pilot's estimation of around four hours of continuous seemed about right in testing. When we did keep them out of the case (something we imagine not many are likely to do, since that makes them easier to lose), we found that the battery life was able to stretch to around four and a half hours at most. A quick note on that charging case: while it's not the sleekest we've seen, it does keep everything locked into place and shows you when your buds are fully juiced. As we say, it's not the prettiest, but it does the job. Waverly Labs' aim was to break down language barriers, and to some extent the Pilot earbuds do that in a more intuitive way to some rivals. The technology itself is still in the early stages, and Waverly's own translation engine will grow stronger the more people use it, but there's no doubt this is a solid first step on the longer journey to more fluid language translation. Things are a little rough around the edges here, but ample sound support and a strong design help this become a well rounded hearable. We look forward to seeing where Waverly Labs takes things in its second go-around. I would LOVE to be able to positively comment on the Pilot...after all, I was one of the first 500 to order a set. Two plus years later, and six months after they shipped the first batch I have STILL not received them. Over nearly three months, they were allegedly shipped, then recalled to ship via a quicker method than the “barge” they’d originally chosen...only it was more than a month before they allegedly shipped again. After two more months, it seemed they were “almost” in reach, with no tracking update for weeks, until it suddenly updated a week ago; they were being sent BACK to Hong Kong. Despite a flurry of emails sent by me over the week, I still have NO idea if Waverly is doing ANYTHING to resolve this issue. I am frustrated and angry beyond belief at their appalling customer service...there is none! Canned responses full of canned platitudes with no information seems to be their marketing and Customer service plan. I have the earpiece for 5 months now and it ends up sitting collecting dust as the functionality and user-friendliness were quite disappointing. There have been a lot of hypes and promising features but we have yet to find them practical or useful, particularly needing 2 separate mobiles phones to download the apps each time the 2 persons need to converse. Using google translate seems more practical. Rather disappointed with the investment.